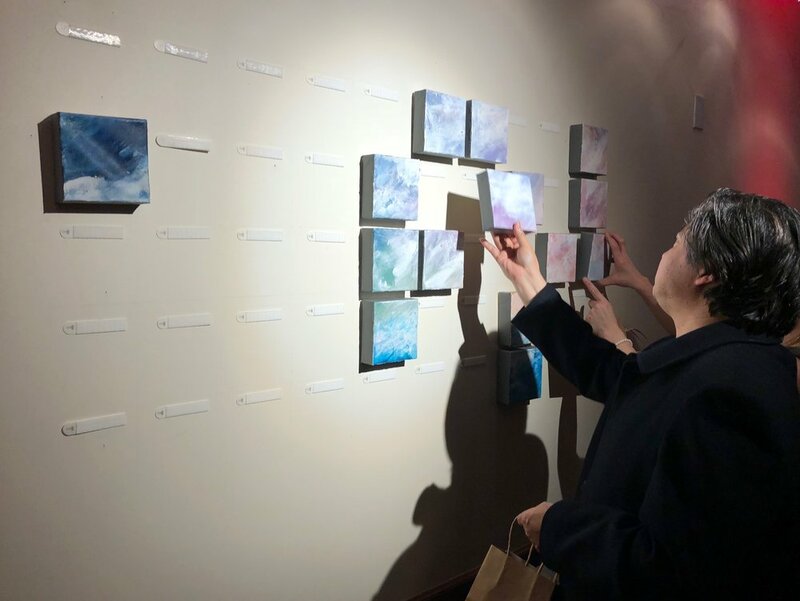 "Gray Matter Series: Dismantling Janteloven" is a 50-piece painting that was created by Anna Lee for The Arts Partnership and presented at their annual fundraiser, An Artful Evening. The following is adapted from the talk she gave, explaining the background of the painting and the interactive element requested of each attendee in order to receive their piece of the community painting. The concept of community is relative- what is supportive and familiar for some, may not be for others. We don’t realize our norms until we interact with other parts of the world and realize that although we are all the same at the core, there are often underlying differences in how we interact with our communities. I’ve spent a good deal of time trying to understand the dynamics of the upper midwest. I grew up in Fargo, North Dakota and was firmly based in Minneapolis, Minnesota for a good sixteen years before moving back to my hometown a couple of years ago. Although Minneapolis always felt so expansive and full of opportunity to me, I started to wonder when many new friends and transplants from other parts of the world were expressing frustration and having a difficult time fitting in. Some call it Minnesota Ice. Moving back to Fargo/Moorhead, I experienced my own version of this and was struck by how closed off things felt, despite the clear support for the arts. I started to feel old limitations and thought patterns creeping back into my mind, impacting the approach I took to my creative work even though I spent years working through the issues and limitations I assumed were my own. Several years ago, I was introduced to the Scandinavian laws of social order: Janteloven, or the Law of Jante. It made the unspoken limitations of growing up in a Scandinavian-American community so clear, and it started to come up again in my journaling a couple of years ago. The Law of Jante was a concept created in the 1930’s by the Danish-Norwegian author Aksel Sandemose, in his novel A Fugitive Crosses His Tracks. There are ten unspoken rules in the law, all variations on a single theme: You are not to think you're anyone special or that you're better than us. Those who challenge this unwritten 'law' are regarded with suspicion and some hostility, as it goes against the town's communal desire to preserve harmony, social stability and uniformity. I can understand where this was effective for a homogenous society. It kept people in perceived harmony. But every good intention can have an unintended dark side. Many of us know the pang of enforcement of these rules through passive aggressive comments and ongoing diminishment. It makes actual success an embarrassment. It pits people against each other so we sabotage ourselves so no one else does. It creates cynicism and promotes mediocrity. And most importantly, it creates isolation instead of actual community. Different versions of this are found in cultures throughout the world, yet there is power in understanding the unspoken order that holds us back (even if some would argue it actually holds us together). Consciousness and transformation through art and conversation are essential. Gray Matter Series: Dismantling Janteloven encourages conversation, awareness, and new thought when it comes to supporting the individual and their unique contributions to a vibrant, inclusive, and thriving community. In an effort to evolve the dynamic, I brought in the support of Juliet Trkna to create a blessing for the canvases before I started painting. When I started this project, I went to the person who originally told me about the Law of Jante, scholar of Ancient Nordic traditions and Volva Stav, Kari Tauring. She mentioned that this dynamic was not such a problem until the Horn Ceremony was done away with. At first I imagined that this must be where the term “tooting your own horn” must come from. Turns out, it was something much more interesting. The following is an excerpt from her writing. The full text can be found here. “Viking art and legend made the Nordic horn ceremony famous, a popular subject of speculation and cartoonish re-enactment with visions of fire lit rooms full of burly men getting piss-faced and swearing oaths. It was much more than this, and still is. Sacred drink ritual survived in countless Midwestern households as coffee replaced mead and “themed mugs” replaced the horn…The intent of sacred drink remains the same throughout time – to welcome, honor, and bond with others…Drinking ritual builds relationships. The rune Gifu (X), [which means gift!] giving and receiving in balance, describes this concept from a Nordic perspective…This is the essence of the Nordic mindset. We must all be sturdy stavs in order to support and be supported by one another, essential in the harsh climate of the Northlands. Drinking ritual creates and supports Gifu. The ability to share ourselves and our gifts is key. We all take turns being the creators and being the supporters. My goal with this work is to create an understanding and a vocabulary for calling out and transforming these outmoded cultural norms. We are so much more than we are often allowed to be within our communities. We need to learn how to share our selves and how to be curious about what makes others who they are. We need to ask better questions, and we will get far better answers. To complete this work, I asked for each person to fill out a card that shared something about themselves that they were ready to "toot their own horn" about. In exchange, they each received part of the greater painting, and a great story to share any time someone asks them about that sweet little 5"x5" painting they have.